During my last semester of grad school, I did a project on “Mobile Apps for the Library” and in the course of my research, I discovered an app and online service called A Story Before Bed that allows users to create a video of themselves reading a book. They have hundreds of books in their collection, including both self-published titles and more familiar books available for physical check out in my own library. 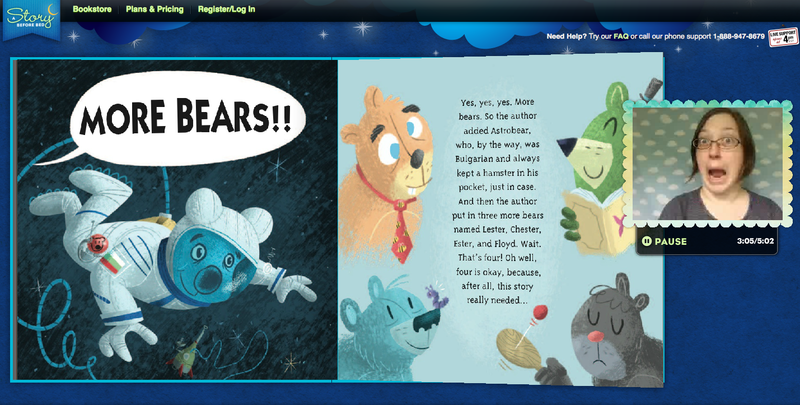 A Story Before Bed has taken care of all the copyright issues for the titles in their collection. Each recording is assigned a unique URL that doesn’t disappear even after your subscription expires. And they had just created an annual subscription model designed for library use. I couldn’t wait to try it out! Because their pricing is calculated “per location” it seemed prudent to do a pilot project with only one branch before committing to subscriptions to all 9 of our library’s branches. I took the idea to our Friends of the Library, who like to fund new ventures like this, and they were quite excited by the idea as well and were willing to fund a year’s subscription. Then, it was up to me to start creating the recordings. After experimenting with several different recording set-ups, we determined that the simplest set-up and the best results came from simply using my Apple laptop. A Story Before Bed isn’t equipped to use standard videocamera footage, so no editing is really possible. Each time I was ready to make a few recordings, I found a sunny window to set up near, hung a piece of fabric behind my head to create a neutral backdrop, and started recording! I chose titles based on which books my library owned because I wanted to make a connection between these “virtual” titles and the physical books on our shelves. During each recording session, I usually recorded 3-5 books. Because I wanted to do each one in a single “take” and occasionally something happened halfway through (like my backdrop falling down or an ambulance driving by outside), doing the recordings was more time-consuming than I’d originally thought. Once the recordings were complete, I posted them on our library’s website along with a link to finding the physical book in our online catalog. I created posters, bookmarks, and business cards directing people to the page that listed the recordings, along with instructions for how they could listen to the stories on their iPhones or iPads, and how (during our subscription year) patrons of our branch were allowed to create their own recordings for free! I also asked some “local celebrities” to create recordings to add to our website. 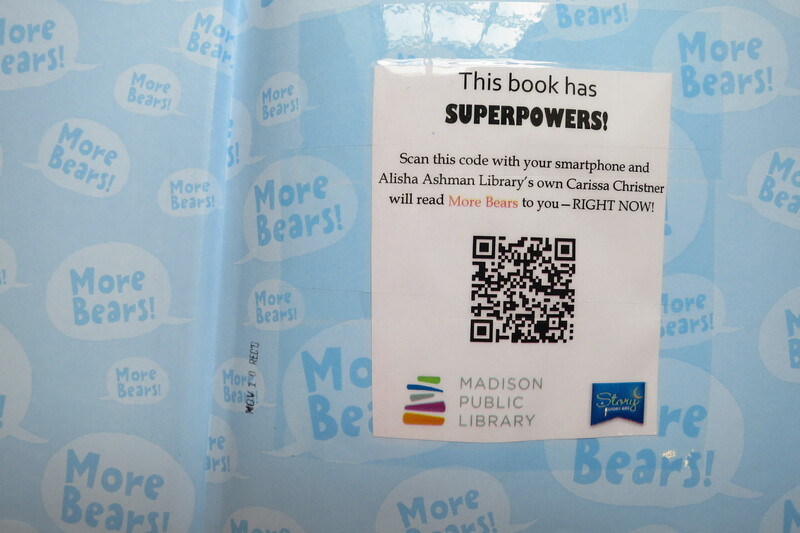 Inside the front covers of the library books that had A Story Before Bed recordings, we pasted a QR code linking to the recording’s URL. After our year’s subscription expired, I realized that I had found time to record about 50 books which, after doing the math, wasn’t that much cheaper than buying individual titles would have been. Only a handful of patrons took advantage of the “record your own stories for free” option (perhaps because their recordings were then visible on the library’s A Story Before Bed account and potentially visible to the public?) and I had recorded most of the titles that our library owned, so I decided to end our subscription and switch to the pay-per-title model for now. Many patrons still tell me how much their kids love to watch me reading books to them on their iPad/iPhone/computer, and when I use those same books in library programs now, someone always says, “I have that book on my iPad!” I have also spoken to teachers who like the possibilities that their students who are learning English have a local source for hearing books read by a native speaker and can hear them being read over and over as often as they need to. I have really enjoyed this project and I’m very pleased with the results. Many thanks to A Story Before Bed and the Friends of the Alicia Ashman Library for making this all possible! P.S. Looking for a more “live” experience? The developers at A Story Before Bed have also created a way to share their same video + book reading experience through Google+ Hangouts! Go try it out for free!! Carissa Christner is a librarian with Madison Public Library. Posted on March 10, 2014, in Interactivity and tagged A Story Before Bed, Carissa Christner. Bookmark the permalink. Leave a comment.